With nearly 400 stores across five countries, we're a one-stop source for domestic, international, and freight shipping services. When you visit your local Pak Mail in Bentonville, we'll find the most cost-effective, safe way to pack and ship your items, whether it's by air, ocean, or ground. Welcome to Pak Mail of Bentonville! We are the World's Premier packing and shipping company for commercial and residential customers. Pak Mail is celebrating our 25th Anniversary! For the last quarter century, we've been carefully “Packing and Shipping Anything Anywhere” — including everyday items, large, heavy, valuable, and awkward. Receiving, Storage, Delivery & Setup Services. Let us help with your next meeting! 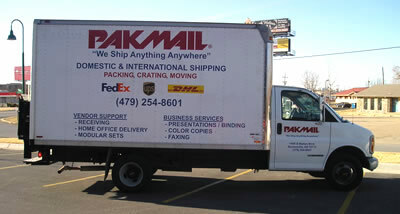 Pak Mail is a comprehensive shipping and packaging center. We use only Reliable Major Carriers to protect your treasures. We understand the value of flexibility, service and convenience to our customers. Our expertly trained and talented staff will find creative and efficient solutions for all your business and personal needs. From the familiar to the priceless, the irreplaceable to the seemingly impossible, trust Pak Mail to pack and ship it carefully, from packing an original Picasso, to shipping a snowman to Florida and an ancient dinosaur egg to Anaheim. Let Pak Mail assess your needs and recommend solutions.